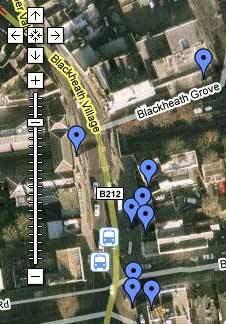 Blackheath is not short of places to buy your favourite tipple. There is the lovely Nicolas of course, pricey and slightly confusing if you know nothing about wine, but very nice nonetheless. And they do a lovely sparkling dry cider (Duché de Longueville Brut) that is much more within the Bugle’s pocket. There is another type of this cider made by the same people that is even better – less sparkling and even drier, but the nearest place to buy it is the greenwashed Sainsbury’s in Greenwich. The Oddbins opposite Nicolas always looks a bit sad by comparison, but is actually much better for English Ales. They hide them right at the back, near the floor (they obviously want to keep it all for themselves), and I recently found both Summer Lightning and GFB, both made by The Hop Back Brewery, and both delicious. Their website doesn’t tell you what GFB stands for, but I have a fair idea. Previously the only place I’ve found this beer has been at Borough Market, or on draught at a wonderful hidden-away pub in Colliers Wood of all places. The other thing going for Oddbins, is the music. Last time I went in there, they were playing Cesaria Evoria – always a pleasure. Then there’s Booze Busters. 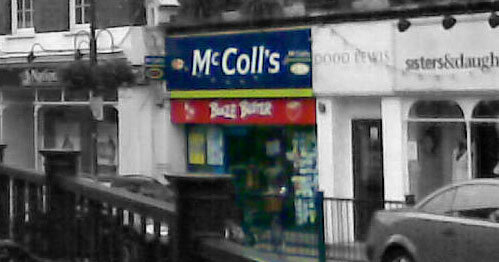 I’m sure I should call it McColls Newsagents or something, but it will always be known as Booze Busters in our house, because of the ugly banner above the shop. This place is ideal for buying a copy of the Daily Mail, and filling your body with High Fructose Corn Syrup, both of which should be avoided at all costs. They do sell cheapish lager though, which can be handy if you’re having people round who haven’t seen the light. Then Shepherd Foods, which I’ve gone on about too much already (check out the fizzy australian ale though), Hand Made Foods who sell some alcohol, (I’m sure its lovely, but I’m always too scared to even look at the prices). And the wonderfully 1970s CostCutter, whose name should be done for under the Trade Descriptions Act. It’s a strange sort of place, but some of their £8 wines aren’t bad. Anyway, that’s all I can think of right now. The combination of a grim nightshift tonight, and an extra-special summer cold is making me think I might prepare a hot toddy to keep me going. If you think of anywhere else worthy of a mention, please drop me a comment!